Yesterday morning, the impactor released by NASA’s Deep Impact spacecraft smashed into its target comet Tempel 1, 6 months after launch. The spectacular, high-speed collision is a 1st in space exploration: Deep Impact’s goal is to provide a glimpse beneath the surface of a comet and unlock the secrets inside. In Europe, the Rosetta mission is on course to rendezvous with another comet, via a different route. A plume of smoke and a huge flash of light confirmed that Deep Impact has reached its goal of penetrating the surface of a comet. Scientists will now start sifting through observations of the ejecta from the impactor collision to find out what lies inside the comet’s pristine nucleus, a remnant of the primitive nebula from which our Solar System formed 4.5 billion years ago. The 370-kg impactor, equipped with its own autonomous navigation system, successfully slammed into the comet this morning at a speed of 37,000 kph after a 900,000-km chase. Depending on the comet’s composition, the crater left by the impactor should be as big as a house or even a football field, and 2 to 14 storeys deep. The first data are starting to flow in, but scientists are already saying that all their expectations have been exceeded and that the mission “is truly a smashing success”. Analysis of the crater will provide clues about the inner structure of the nucleus and the mechanisms of comet formation, which are still poorly understood. The Deep Impact mothership observed and took pictures of the explosive encounter from a safe distance of 500 km, using 2 cameras and an infrared spectrometer. 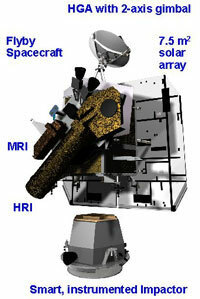 The collision was also seen by many ground-based and space telescopes. In Europe, a slower spacecraft is en route for a more peaceful encounter with a comet, in pursuit of a similar objective: to learn more about the origins of our Solar System and perhaps of life as we know it. Rosetta set out on its journey in 2004 and will only reach its target in 2014. Why so long? It’s nothing to do with speed or power, just a different strategy. Deep Impact met its quarry head on in a high-speed celestial crash. On the other hand, Rosetta will go into orbit around its target comet and release the Philae lander for a soft touchdown on the surface of the nucleus. The orbiter will then track the comet from a distance for 2 years as it gets closer to the Sun. This soft landing calls for a different approach strategy. While Deep Impact took only 6 months to reach its target, Rosetta is an 11-year mission. 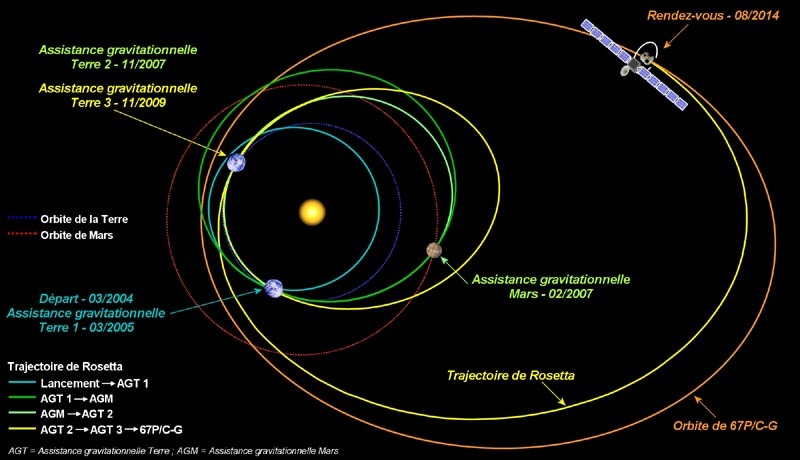 Before closing in on the comet, the orbiter will complete several revolutions around the Sun, using gravity assists from several planets to boost it on its way and adjust its trajectory. Rosetta and its Philae lander are carrying 21 science instruments to glean a wealth of data about the composition and structure of the nucleus, as well as the material outgassing from its surface. But we have a long wait ahead of us. Until Rosetta unveils its own secrets, the scientific community is eagerly awaiting the results of the Deep Impact mission.